I worry that I am going to run out of things to say to you on your birthday. When I write your sister birthday letters, I go over all the things she did that year: my favorite memories, her changes, our adventures together. But when your birthday comes around, I can’t do that. Our adventures have been chronicled, best memories shared. But the worst is that you aren’t changing. You are frozen at seventeen months old, and on your birthday it just seems extra unfair. Your little sister Annie loves birthdays, so we talked yours up to her today. And…it was hard. She was so excited about your birthday, but she didn’t understand. She kept asking when we were going to your house, where your party was, when she could see you. I kept explaining it to her over and over, but she just wanted to see you so badly. “When can I see her, Mama? Where is she?” She wanted to give you a hug and a present and help you blow out your candles. Later, we let her blow out a candle after she sang you Happy Birthday. She clapped and smiled and said, “I blew out the candle for Maddie, my big sister!” She was so proud of herself, but I couldn’t help thinking that if you were here, you would not have been happy about her blowing out your candle. Or maybe you would have been a patient and generous big sister…yet another thing that I will never know. If everything goes well, you’ll be a big sister again next year. We went to your favorite park today and I watched two brothers go down a slide. The older brother pulled his younger brother into his lap and carefully slid down with him. Would you do that with Annie? Would you do that with your next sibling? One thing I think about a lot is the moment Annie will meet your shared sibling. I know that moment will explode my heart, and I hate that you won’t be there. I hate that you never met Annie, and won’t meet this brother or sister, either. I hate that you are missing out. I hate that you won’t grow up with your siblings. I make sure I say your name every day. Annie and I say “Maddie” a dozen times a day – she loves to talk about you – but at night when everyone is sleeping, I say your whole name softly to myself. When I was on bed rest with you, I’d stare at the bumps on the ceiling and slowly say your name over and over. I love your name, Madeline Alice. I love you. I miss you so much. I will never stop wishing you were here with me. Happy fifth birthday Maddie. I’m so sorry you’re not here to experience it like you should, but I know you know how loved you are – wherever you are. So, so, loved. So loved. All my love and best to you and your family Heather. Always. Sometimes, when our daughter (almost five) is ‘reading’ her little brother (Annie’s age) a story, I think of you and of both your beautiful daughters. I think about them, and silently cry a little. Sometimes, when her twin is strangling his little brother or chasing him around the house, I do the same. It’s so heartbreaking to read your posts about Maddie, but at the same time, it’s overwhelming to see the amazing effect she has had on not only myself, but hundreds, if not thousands of others. She has made me appreciate my own two daughters (not that I didn’t already), but she has made so aware of how lucky I am to have two girls that were born healthy and have grown up to be strong and good human beings. I can’t begin to know how you are feeling, but suffice to say that I wish things could have been different for you. Here’s to next year, and hopefully a healthy sibling for Maddie and Annie, and even more joy in your life. You deserve it. Happy 5th Birthday Maddie. What a beautiful letter Heather. My thoughts are with you all. Thank you. As always. Thank you for sharing her with us. Thank you for providing much-needed perspective. Thank you for your amazing candor and heart. Happy birthday, Maddie. I’m sorry you’re not here–your smiles always make my day better. I can only imagine the magic you made in person. I never got dressed at all yesterday, I spent the day in bed, so I’m doing my usual purple wearing today instead. I wish like everyone else this birthday was one she was here on Earth to celebrate with her family. Happy Birthday, Maddie! I try to send positive vibes to your family every day. We never met, but you are one of the things I carry in my heart that reminds me to be a better person. You are never, ever forgotten. Peace and love and prayers to you Heather, and to Mike, Annie, Rigby, and tiny Spohr. You are all loved. Love to you all. Happy Birthday, gorgeous girl. Happy Birthday sweet Maddie. My thoughts, prayers and love to all of you. Heather – I am so with you about the wishes and the wants. I wish I knew so much about my sons Jake and Sawyer. On what would have been Jake’s 5th birthday I started writing my blog because I wanted to find a way to continue to honor him and now his brother Sawyer. Sawyer would have been 3 later this week. Our twins also ask endlessly about their older brother Jake who they never knew and their younger brother, Sawyer, who they knew for only 6 short weeks. When they ask to see Sawyer I show them pictures which only lead to more questions. Maybe Maddie, Jake and Sawyer are having a cosmic birthday celebration this week. Thank you for sharing your story – I don’t wish anyone to be a part of the club we both are but it does help to know that we are not alone. Sending you hope and hugs. Take care. Happy 5th Birthday, sweet girl. This hurts to read. I can’t imagine the pain you’re going through. All the best to you. Oh,,,how I love looking at that beautiful picture………………….. Happy Birthday, Madeline Alice. My daughter is just 10 days older than you and we wore purple on your birthday. Is Maddie doing the wacky thing? hehe.. Happy Birthday sweet Maddie. Many hugs and love to you all. Happy Birthday Maddie! We miss you here!! many hugs and kisses to you and Mike. Happy birthday, Madeline Alice. I love that you say her name every day. It is a beautiful, perfect, fitting name. Ah, Happy Birthday Madeline Alice! Heather and Mike, I am glad that you have the short memories that you have of her! Her pictures always fill me with a sadness, but put a smile on my face too. She had the prettiest eyes and infectious smile! We wore purple this weekend in honor of Maddie. Happy Birthday Madeline Alice Spohr. And hugs to you all. Love to the Spohr family! Much love and mnay hugs to all of you. Holding you close in my heart. Your mommy always knows just what to say. I can totally see you and Jackie swinging around dancing up there. Enjoy some birthday cake and blow out those 5 candles! Happy Birthday Sweet Sweet Maddie. Much love going out to the entire family. Happy Birthday Maddie, the little spark that lit up the world. You are so missed even by those of us who never got a chance to meet you. Hugs to you Heather and Mike and the whole family!! I don’t imagine it does much to quell your pain, but I love that (at least as best as I can tell) Annie only speaks about Maddie with happiness in her voice. Eventually she will gain the perspective to understand that talking about Maddie brings with it a great deal of sadness for you and Mike. But at least for now, I hope that seeing her excitement and happiness about Maddie helps you find your own smiles on hard days like this. Happy Birthday sweet Maddie! Sending your Mommy, Daddy, sister and little one extra hugs today. My heart breaks for you. I relate to you when you write about wondering if you will run out of things to say each year for Maddie’s b-day. I too have have wondered this same thought. My little girl would have been 5 last month, but is frozen in time at 7 months. Keeping all of you in my thoughts & prayers today and wishing Maddie a very Happy Birthday! Happy birthday, Maddie. She’s so beautiful, and it’s so unfair that she’s frozen in time and in age. What a gift she was and continues to be, five years later. Another beautifully worded letter to your daughter. Happy birthday Madeline Alice! Thinking of you and your family! Happy birthday Maddie. You are so loved. I love this picture. She always had such a wide open smile. Happy birthday, beautiful Madeline. I’d like to say upfront that I mean no disrespect to you or your family with my comment. I wonder if you’ve ever spoken to a child psychologist regarding your approach to honoring Maddie’s memory and what impact it may have on Annie? Clearly she is too young to grasp the loss that you have suffered and all of the implications. My heart breaks for you, Mike, Annie and your families. I have a sister named Madeline. My niece passed a week after she turned one. So happy for you all that in spring you will have a little bundle of joy to bond with Annie. That post made me cry. Sending you hugs and love. Please know that your gorgeous little girl will NEVER be forgotten. I think of her and her beautiful eyes and giant grin daily. Happy Birthday sweet Madeline Alice. Happy Birthday Maddie. You are loved and never forgotten. Happy (belated) Birthday, Madeline Alice. Sending everyone in your family hugs and love from afar. Happy Birthday Maddie!! Your sweet baby will never be forgotten. Its just amazing how many lives she has touched. What an impact for such a small little girl. It is so sweet and sad that Annie wants to celebrate with her big sister. I am so sorry Maddie is not here to celebrate with you. Happy birthday, Maddie, and happy anniversary of becoming parents, Heather and Mike! I thought of you all day on the 11th- I hate that such a happy day also gives you sad memories. You are in my thoughts, as always. I thought of Maddie last night as I dozed off to sleep. Happy birthday, sweet girl. I’m so sorry she’s not here with you. So beautiful. You are such an amazing writer and it is clear that you are a loving and extraordinary mother. No wonder sweet Maddie picked you. Love to you and your family, today and always. Life is simply not fair. Oh Heather, my heart breaks a bit every time I read these. Thinking of you. Wishing for the kind of peace that surpasses explanation to wash over you today. I know of no good words, but I know that there are these times during my grief when I feel this unexplainable peace – just for a moment it all seems to fall into perspective and I appreciate the person that was here and how this terrible event made me in to who I am. I celebrate the privilege of knowing them and the opportunity to have felt their love. The moment passes and I ache with sadness and emptiness again, but I had that moment of peace. Each time it washes over me I feel like maybe life might be ok again… someday. If only for a second, I wish that wave of serenity reach you today (and every day, really). Happy Birthday Maddie! As a preemie myself, born at 1 pound, 3 oz. at 24 weeks gestation, your story has touched my heart in endless ways. I wore purple for you and had a dance party in your name yesterday! Much love to Heather, Mike, Annie and new baby! Thinking of you all today, and wishing Maddie a very, very happy birthday. This made my heart break for you all over again. Sharing tears and love with you. Happy birthday, Dear Maddie. We all love you. I wish I could reach into my computer and give you all a huge hug. Remembering with you today as always, sweet Madeline Alice Spohr you will forever hold a special place in my heart. 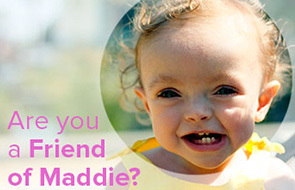 You will never be forgotten – Happy Birthday Maddie Moo! Miss Maddie, as you know your parents love you more than anything in this world you are one special little girl-you have touched not just their lives but literally thousands, you bring hope to those who have babies in the NICU and comfort in the bags you send to them. Your presence is amazing. My heart breaks, having never met her, or you. She is sandwiched, age wise, right between my own girls. Miranda will be 6 next week, Kaity 5 in February. KK was a baby when I first read of Maddie and what happened. You have held such a special place in my heart ever since. I hope all the best for your family. I know time cannot heal your heart…but I do pray that hole is surrounded by more and more joy. Happy Birthday, sweet, beautiful Maddie. Crying, sitting here at 5.30am, watching the sun come up in a strange country. You write it out so beautifully, Heather. I’ve been thinking of Maddie the past few days, the 11th is Rememberance Day in Aus. I’ll never forget her. She’s so beautiful. I reckon you would have lit those five cake candles over and over and over again, watching your girls take turns blow them out. That’s what I reckon, and that’s what I wish happened. So much. Love and peace to you in your heart. I’ve drawn such a strength from your words in the past few months, it’s remiss of me not to say thank you. You transcribe grief with such illumination …. but I wish you didn’t have to. Thinking of you and your family, as always. happy birthday to your beautiful girl. My heart just breaks for you. With a heart like yours, Heather, you will never run out of things to say to and about your sweet girl. Happy Birthday to sweet Maddie, her story has touched so many and I know she is dancing with Jackie! Happy birthday beautiful Maddie. You are loved very much! Happy Birthday Sweet Maddie…you are missed. Happy belated Birthday to your Maddie….wherever she may be. Love that picture of her, brings a smile to my face. Heather, this will never stop breaking my heart. I remember seeing Maddie’s picture on someone’s blog for the first time and searched until I found your blog. She is so beautiful and I was sad to find out that she had passed away. Oh Heather! I hate that your Maddie isn’t here with you, celebrating with you, looking after her siblings….life can be horribly unfair. Your Madeline touched my life in such a tangible way–her eyes, her smile, her joy: they were infectious & could fill a heart up! I wept & grieved over her as a stranger when she died….but when my nephew passed away 3 years ago, then I had an inkling of how your life had changed. And when he had a little brother he never met, I understood what you would mean when you talked about Maddie & Annie. Now I think of your 5-year-old Maddie & wish she were here with her family.